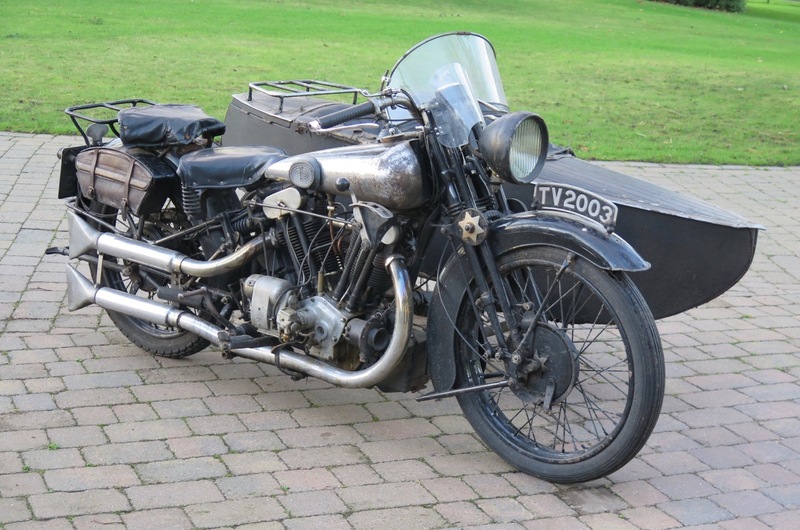 One of only 21 Brough Superior SS100 motorcycles made in 1930, and believed to be the only one that left the factory with a sidecar, will be offered for sale at H&H Classics auction. 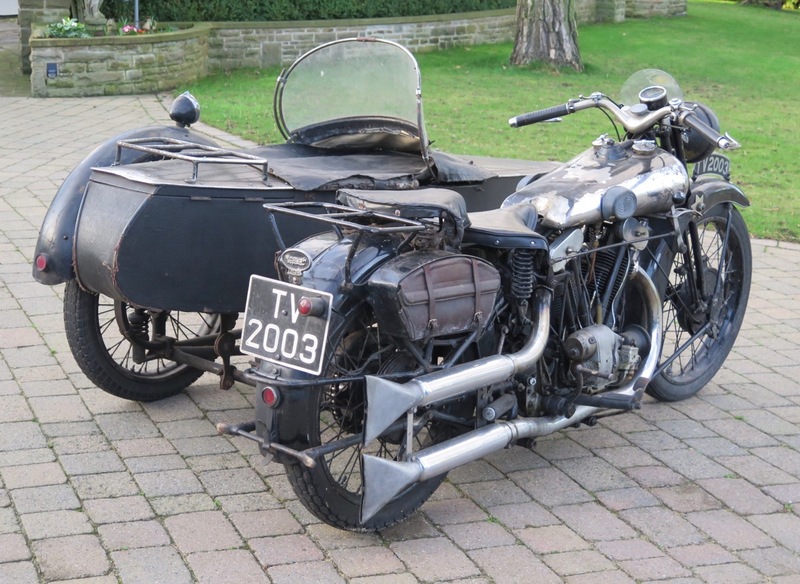 One of only 21 Brough Superior SS100 motorcycles made in 1930, and believed to be the only one that left the factory with a sidecar, will be offered for sale at H&H Classics auction April 19 in Duxford, England. 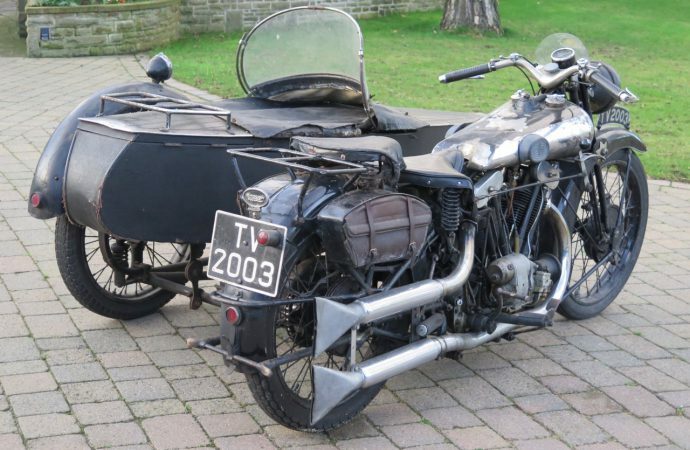 H&H believes the unrestored bike and sidecar could bring a potential world auction-record price and has set the pre-auction estimated value at £280,000 to £350,000 ($390,000 to $490,000). The current record price for a Brough Superior SS100 is £315,000, the auction house said. H&H reports that 69 SS100s were produced in 1925 and sold for £170 each, (equivalent to £8,700 in 2016, or $12,240 at the current exchange rate) and were advertised by Brough as the “Rolls Royce of Motorcycles.” Each was delivered with a guarantee it was capable of speeds of 100 miles per hour. “The fact that this magnificent motorcycle is unrestored only adds to its attractiveness for specialist collectors who might decide to restore or, indeed leave it in its present good condition much as it left the factory 86 years ago,” George Beale, H&H Classic motorcycles director, said in the news release. Of 283 SS100 models produced from 1925 to 1934, H&H says only 131 are known to have survived. Only 21 SS100 models were made in 1930. The auction house said the build car shows this Brough, with registration number TV 2003, was made to order. H&H believes it may be the only SS100 to have left the factory with a sidecar attached. The bike has a Bentley and Draper spring type frame, No. S 1017, with a J.A.P overhead valve ‘V’ twin 994cc engine, No. JTO/W 91700/SC. It is fitted with a four-speed gearbox rather than the standard three-speed. H&H said that according to the Brough Club, the gearbox number indicates that this would have been fitted in 1933 and more than likely at the Brough factory. Records show the car was returned to the factory after its original purchase and changes were made, including a twist-grip throttle instead of the original lever-type throttle, before it went to its next owner. Normally sidecars were fitted to the SS80 models designed with a more sedate side-valve engine than the sportier SS100 overhead-valve model. 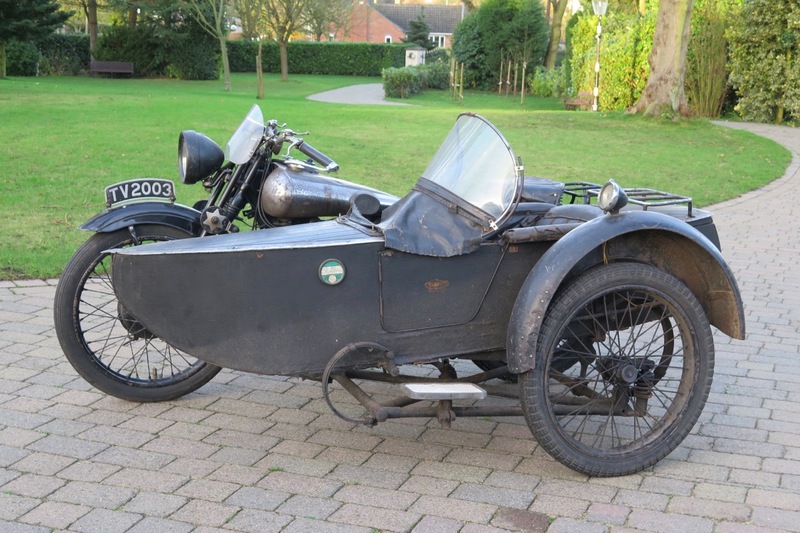 The sidecar is a Cruiser model fitted with a special sprung frame which was introduced in 1928. The earlier rigid frame ones caused handling problems when fitted to the Bentley- and Draper-framed machines. “I have owned TV2003 for a very long time and have travelled many miles with this bike to Austria, Switzerland, Germany, Italy, Spain, Norway, Sweden and Portugal on very many Brough rallies as well as all the annual rallies of the Brough club,” bike owner Frank Solano is quoted in the news release. To see a video of the bike in motion, visit the YouTube site.